“I would like to say a MASSIVE thank you for being a part of the day!!! The car was absolutely stunning and you were awesome too!!! “We can’t thank you enough for supplying such a beautiful car and service for our wedding last Friday. You were amazing and we appreciate everything you did for us to help our day run smoothly. From the second you arrived at our front door with red carpet to the end of our bridal party photos where you poured us champagne and made sure all the girls were warm with your shawls it was a positive experience. You drove us to our photo destinations, helped me in and out of the car with my dress and veil and even made sure they looked perfect for our photos. We could not fault a thing about your service and beautiful limo and will highly recommend you to everyone. 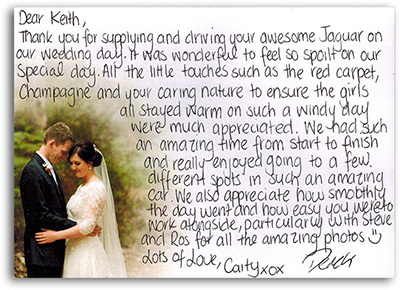 “Hi Keith, Just want to say a big THANK YOU for helping to make our wedding day truly magical. Your professional yet friendly attitude helped everything to run smoothly and we had a blast! The jaguar was absolutely perfect! “Hi Keith, Thank you so much for being a part of our wedding day! It was perfect, and I absolutely loved the car. You were such an easy going driver and you always had a glass of bubbles on hand for me between photos. I would highly recommend yourself and your beautiful limo to anyone on the hunt for a car for their wedding day. “We really enjoyed the wedding day and the Jaguar was just perfect!! Thanks for all your help and patience on the day. We really appreciated it.